Rule # 1: The secret is in the rest of your faceThe paler the skin, the more pop. Go light on the eyes and redness, or you may look like a clownRule # 2: Line the inside of the lipsRed lipstick tends to bleed, to fill the lips with lip liner first, suggests makeup artist Ashunta sheriff in Harper's Bazaar.Rule # 3: Choose the right colorIf your complexion is pink, you'll look better in plum shades, while girls with yellow tones are flattered by warmer reds that have a brown background, according to celebrity makeup artist Jemma Kidd Harper . A great color on almost everyone MAC "Blaze" pictured here.Rule 4: Do not let nails clashWe prefer not red nail polish when you go red on the lips. A color transparent varnish or light is cold, dark and Polish is a trend that shows no signs go away anytime soon. If you want to go red on the nails, make sure the color matches your lips.Rule # 5: Blending isNo make-up stick with a shade of lipstick all, they tend to mix a bit to create the perfect color. If you purchased a lipstick shade that is too light, dark or otherwise, please do not. 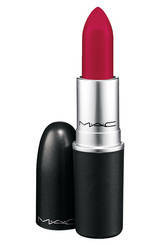 Instead, experiment with shades of lipstick you have on hand to create the perfect shade of red.